Most Reverend Peter Joseph Hundt was born in Hanover, Ontario, on August 26, 1956. He attended St. Peter's Seminary in London and was ordained to the priesthood for the Diocese of Hamilton on May 8, 1982. After serving as an associate pastor at St. Eugene Parish in Hamilton from 1982 to 1985, Bishop Hundt completed graduate studies at the Pontifical University of St. Thomas Aquinas in Rome, and in 1987 was awarded a license in canon law. On returning to Canada, he served as Vice-Chancellor of the Hamilton Diocese from 1987 until 1990 and as Chancellor from 1990 to 1994. From 1994 -2006, Bishop Hundt served as the pastor of Holy Cross Parish in Georgetown, Ont. 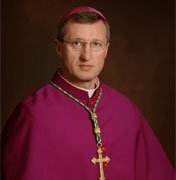 He was appointed Auxiliary Bishop of Toronto by Pope Benedict XVI on February 11, 2006 and his Episcopal ordination was celebrated on April 25, 2006 at the Cathedral of Christ the King, Hamilton, Ontario. Bishop Hundt was installed as Bishop of the Diocese of Corner Brook and Labrador on April 13, 2011 at the Cathedral of the Most Holy Redeemer, Corner Brook. On December 12, 2018, Pope Francis named Bishop Hundt as Archbishop of St. John’s.